The Crown Heights Jewish community is not one community and that’s a good thing. Please Note: This op-ed does not apply to members of the Crown Heights Hatzolah, Crown Heights Shomrim and all other Chesed organizations designed to help all Jews living in the Crown Heights neighborhood. Although these organization are comprised of many individuals from many different factions, but when it comes to helping Yidden they are here for everybody and everybody is here for them (for support). 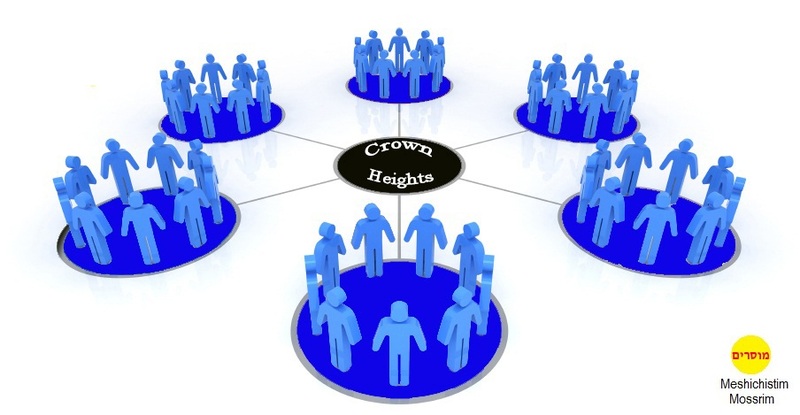 The Crown Heights Jewish community today is no different then what you will find in the Jewish Communities of Borough Park, Williamsburg and beyond. Just as you will find in the Jewish Communities of Borough Park, Williamsburg and beyond many different sects or factions, each with their own community structure, their own institutions, their own organizations, their own Shuls, their own Rebbe’s and Rabonim/Rav etc..etc.. So too (Baroch Hashem) you will find this in Crown Heights. In the past 20 years (since the passing of the lubavicher Rebbe Zt”l in 1994), over 40 new Shuls (if not more) were established. Each Shul today is basically its own community. This structure brings only more goodness and kindness to the neighborhood. There are more Torah classes, more organizations to help the needy, etc…etc… and most importantly more personnel responsibility. So before you go commenting about what the so called “community” has to or should do, or what the so called “leadership” has to or should do, ask what you personally are doing in your specific community to make things better. When you manage to convince the people of your community and/or your family at home to take action (whatever the call of the day is), only then come to everybody else in the neighborhood (all the other communities) and demand that they get involved as well. And guess what? Even if you fail to convince your own family and friends to join you. Don’t give up. If you truly indent to do something good, then do it yourself. I’ve come to realize a very long time ago that if your not going to do it yourself, it’s not going to get done. If there’s no “we” then there’s “YOU” and you alone. In a place where there is no man, be a man! “When I was a young man, I wanted to change the world. I found it was difficult to change the world, so I tried to change my nation. When I found I couldn’t change the nation, I began to focus on my town. I couldn’t change the town and as an older man, I tried to change my family. Now, as an old man, I realize the only thing I can change is myself, and suddenly I realize that if long ago I had changed myself, I could have made an impact on my family. My family and I could have made an impact on our town. Their impact could have changed the nation and I could indeed have changed the world.” (Rebbe Levi Yitzchok of Berditchev zt”l). My father said: A Chassid creates an environment. If he does not, he had better check his own baggage carefully, to see whether his own affairs are in order. The very fact that he fails to create an environment should make him as broken as a splinter. He must demand of himself: What am I doing in this world? (Hayom Yom 30 Adar I, Rosh Chodesh). There is only one very small faction within the Crown Heights neighborhood that tries to enforce themselves on everybody else. 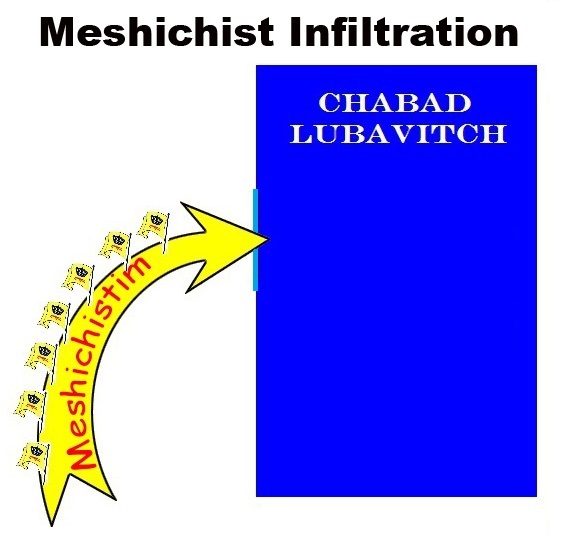 This faction is known as the Meshichist Mossrim and/or Corrupt Cabal of the CHJCC and/or (Currently) the B.S. (Braun & Schwei) faction (all these mentioned factions are one of the same). They can also be referred to as the 770 basement crowed. (More on who are the 770 basement crowed to come). This small faction of Meshichist Mossrim has no community structure, the only common thing that “unites” (comm-unity) anybody who claims to be of this faction is baseless hate, contention, jealously and strife. As long as they have a common “enemy”, they will be “untied”. Otherwise (as we have seen over the years), they destroy each other. This faction has no structure, no leadership, no organization that truly helps the needy, no Rabonim/Rav and definitely no Rebbe. This faction is comprised of losers who after all this time, have not found their place in a proper community. No community let’s them in by choice, so they resort to using force and infiltration. They can’t win over our hearts and minds so they try to take it with force. They try to infiltrate us with their propaganda. Propaganda in which they mask under a false and fake “ideology” of Rebbe and Moshiach. We all know this/they have nothing to do with Rebbe nor Moshiach, it’s all about power and money. If we don’t give them the power (they demand) they will take it by force. They try to force upon us there so called “Vaad Hakoul” and so called “Beth Din”. This Meshichist faction and/or “community” is the only faction attempting to infiltrate into other communities. Now (unlike 15-20 years ago) they are on the outside so desperately trying to get [back] in (by force). They are not wanted or welcomed anywhere and they know it. 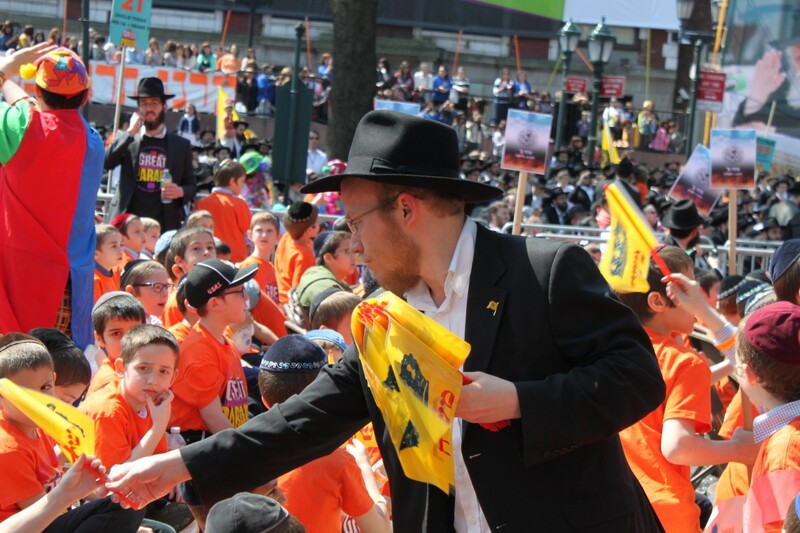 Proclaiming ‘Yechi’ and waving their flags* (at the parade or anywhere else) has nothing to do with their false false and fake “ideology” or believe, it’s all about making a statement of “we are still here. * As the graph shows above, the only people who let them infiltrate are the cowards (in light blue as described here), who are not strong in their principles or (and most likely) have another agenda (which I will talk about in my next post). 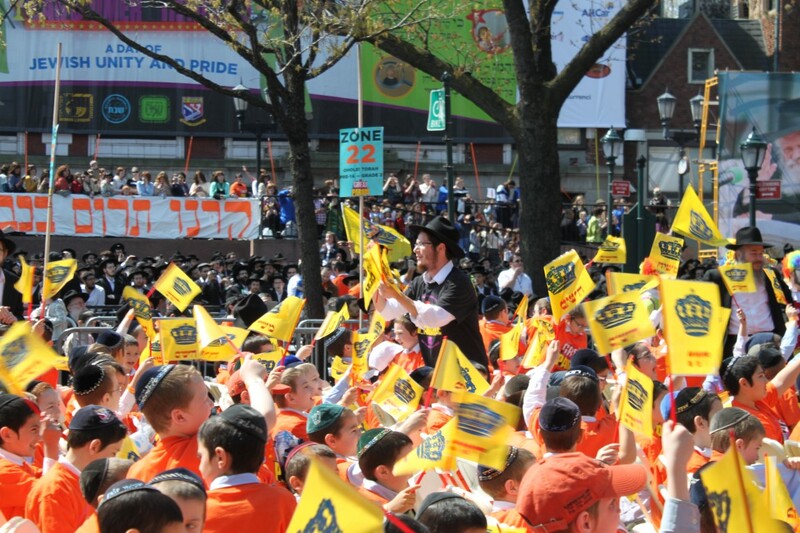 [Photos] Meshichistim Infiltrate ‘The Great Parade 5773’ by distribution their flags to the children without permission from the parade organizers, schools and parents. Can There Be Peace With A Beast? This entry was posted on April 30, 2013 at 12:54 pm and is filed under Mishichistim Mossrim, Op-ed, Opinion. You can follow any responses to this entry through the RSS 2.0 feed. You can leave a response, or trackback from your own site. In my community/shul we don’t let any meshichist propaganda/yechi. We throw it all to the garbage and it goes without saying that no yechi in said in our shul. Without the flags and their flag wavers there would be no sign of meshichist existence. This is why it is so important for them to Davka do this at the parade. And who are these flag wavers? They are a bunch of 19-22 year old bochrim who are here to serve the meshichist agenda. May I add that they are here with visas Mendel Hendel bought from the yeshiva. Anything I get in the mail that has ‘yachi’ on it i throw straight into the garbage. If anybody or organization that’s leaves advertizements with ‘yechi’ by my building lobby, I throw straight to the garbage. When a Meshichist knocks on my door requesting money I turn them away. At first this was hard to do, but after the Shomrim Six Mesirah by Meshichistim it became a very easy thing to do. Every dollar you give these people is a dollar towards Chillul Hashem and Mesirah. It is forbidden to give them anything!!!!! 1. There are about 70 shuls in Crown Heights as of this day. 2. 20 years ago there were about 800 families is Crown Heights. Many were not Chabad. Most of the shuls then were not chabad. Today there are about 3000 families. 3.20 years ago 770 Eastern Parkway was considered the center of Crown Heights, today not so. Being a Crown-Heights resident, I often hear people discussing and questioning the future of “Lubavitch.” They mention teens falling “off the derech,” deteriorating tznius standards, constant fighting of rabbonim and other ills. (Some will also add to the bunch, the “Tzfatis”). There are certainly many accomplishments, some unprecedented, to be proud of. 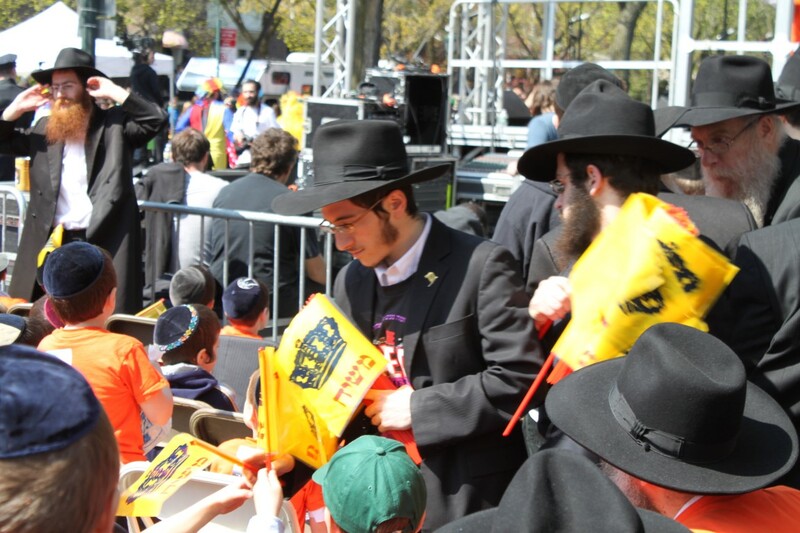 4,000 Shluchim and counting, thriving Chabad communities, schools and yeshivos that are filled to capacity and an abundance of new seforim and publications – in more than one language. But, as is the way of life, it is the negative that draws our attention and looms over the horizon. We daven for redemption, yet worry what the future has in store for us. What will be with our children and in what kind of world are they growing up in. This past Shabbos I was proven wrong. I spent it with close to 1,000 chassidishe yidden. Anash, Shluchim, bochurim and even a few rabbonim. The point of gathering was in a row of tents near the Old Montefiore cemetery in Queens, where the Rebbe’s holy Ohel is located. The occasion being the Shabbos before Gimmel Tammuz. It was a first for me and I came there hoping to be inspired and uplifted, and to rejuvenate hiskashrus to the Rebbe. By the time Shabbos has ended, I left there with much more than that and that is the reason why I am sharing my thoughts with you. What I saw there was the future of Lubavitch. I saw there the real, original and authentic Lubavitch. The Lubavitch the Frierdiker Rebbe writes about in his memories. The Lubavitch the Rebbe wanted and dedicated his life to. We might have been near a cemetery, but all I saw was life – מה זרעו בחיים, אף הוא בחיים. I saw the new generation of bochurim, of those who sit and learn chassidus before davening, who daven with a geshmak, bochurim with whom I had conversations in nigleh and halacha, needless to say chassidus. Bochurim with whom politics weren’t discussed at all, because it was not of interest to any of them. There were hours-long farbrengens, niggunim were sung, stories were told, sichos were reviewed and L’chaim was said, yet adhering to the limits of the Rebbe’s gzeirah on mashke. I didn’t see anyone going wild, no booklets being banned or opinions and slogans being imposed on others. I left inspired by what I saw, by the fact that there is a positive Lubavitch outside of Crown Heights, that there are bochurim who respect rabbonim and who want to become rabbonim, that there are bochurim who are striving to be Chassidishe Baale Batim, and Shluchim, and chassidim and just want to fulfill whatever the Rebbe wants from them without agendas, loopholes and excuses. I therefore would like to highly recommend to all cynical people out there: Take the trip to the Rebbe for Shabbos. Do yourself a favor, leave the politics behind and see that there is a future. You just have to know where to look. Thank you Rebbe! אשרינו מה טוב חלקינו!